The recovery for the construction industry has struggled to take hold. After plunging 24 percent in 2009, new construction starts leveled off in 2010, raising hope that the stage was being set for 2011 to be the initial year of renewed expansion. However, new construction starts have bounced along the bottom during 2011, not able to achieve upward momentum in any sustained manner. This year’s lackluster performance is the result of decreased activity for single family housing, public works, and institutional building. However, a few bright spots have also emerged in 2011, including improvement for multifamily housing and manufacturing plants, as well as a surge of new electric utility projects. Even commercial building has provided some positive news as warehouses and hotels picked up the pace after a very depressed 2010. Still, the pluses have not been enough to outweigh the minuses, and the result is yet another year of weaker construction activity. For 2011, new construction starts are estimated to come in at $410 billion, a 4 percent decline from 2010. The backdrop for the construction industry is the fragile U.S. economy. Real GDP in the second quarter of 2011 grew just 1.3 percent, and for all of 2011 the GDP increase is estimated at 1.6 percent, down from 3.0 percent for full year 2010. The employment statistics also reflect this picture of a decelerating economy as job creation fell to a pace of 72,000 jobs per month during the May–September period, keeping the unemployment rate at 9.1 percent. The economic slowdown during the first half of 2011 was related to higher energy prices and supply chain disruptions caused by the earthquake in Japan. Adding to the rising anxiety about the U.S. economy has been the spreading European debt crisis and the protracted debt ceiling debate in Washington, D.C. Reflecting this uncertainty, the estimates that the United States would slide back into recession grew from less than 20 percent at the start of 2011 to about 40 percent in September. While the risk of recession is now higher, there’s still a better than even chance that the U.S. economy will be able to avoid recession through the end of 2011 and during 2012. Job growth, while weak, is still taking place. Corporate profits have been generally strong, and firms are sitting on substantially more cash than back in 2008. The banking system is healthier than a couple of years ago, and the volume of commercial and industrial loans is rising once again. Interest rates are very low, and energy prices are now settling back. In addition, the European Central Bank has taken steps to contain the debt crisis, although it’s still unclear how effective these steps will be. At the same time, the U.S. economy will be absorbing spending cuts for federal programs, as set forth when fiscal 2012 appropriations are finalized, and also will be affected by the mechanisms put into place by the Budget Control Act of 2011. Support from the 2009 federal stimulus act has mostly run its course, and state and local governments continue to deal with tight budget conditions. The current level of uncertainty about the U.S. economy remains quite high and at best will only ease gradually over the next few quarters, which will restrain private investment. The result is a U.S. economy that grows at a tepid 2 percent in 2012 as the period of stronger expansion (3 percent or more) gets pushed back at least another year. In this environment, it’s forecast that new construction starts for 2012 will be $412 billion, essentially flat with 2011. While the top-line numbers are not expected to show much change, there will be some variation within the major construction sectors during 2012. Single family housing and commercial building are expected to see moderate gains from current low amounts, although the levels of activity will remain depressed compared to a few years ago. The upward trend for multifamily housing should continue, along with improvement for manufacturing plants. The tough fiscal climate will lead to further declines for public works and the institutional building sector, and new electric utility starts will retreat from the exceptional pace reported in 2011. 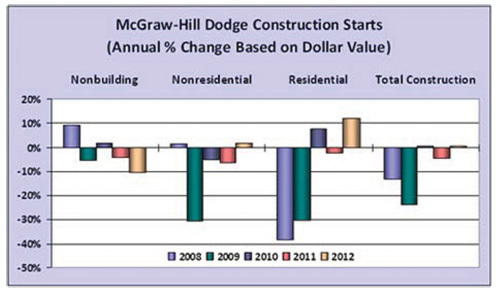 The 2012 Dodge Construction Outlook is now available as a PDF in McGraw-Hill’s Analytics Store. A mainstay in construction industry forecasting and business planning, this comprehensive 32-page report includes more than 60 charts, tables, and graphs. 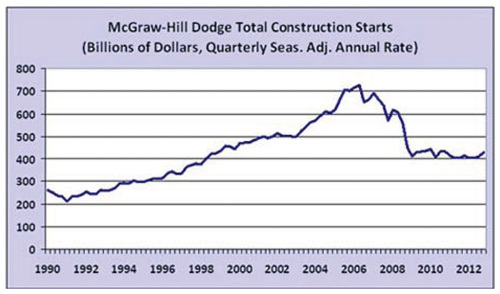 To learn more, visit http://analyticsstore.construction.com/dodge-2012-construction-outlook.html.